the Farm @ Echo Bend2943 Herring Rd. Price for Broilers is $3.00/lb. Boilers may be cut up for an additional charge of $1.50 per bird. Deposit is $5/bird credited against the final price. Available the week of Thanksgiving. Price: $2/lb hanging weight plus butchering costs. Note: We only raise the animals which you order. This means that you need to place your reservation a.s.a.p., as we order chicks and piglets late winter/very early in the spring. Comments, questions, suggestions welcome.. Document your copy of this order and post on the refrigerator so you won’t forget what you ordered. Please return the second copy of the completed form to us for our records along with the deposit for the meat ordered. Can I visit the farm and see the animals? We welcome visitors. Spring is a popular visiting time, before the animals lose their “cute” factor! If you come to visit you can assure yourself that your food is being humanely and sustainably raised. The animals are farm-raised on pastures in movable pens with access to clean pasture every day, not in the confined industrial systems that provide most American meat. Besides the foraging for grass and roots and bugs, the animals get leftover fruit and vegetables from our orchard and gardens. We also feed them grain (oats, buckwheat, rye, and corn) that we raise ourselves on the farm. Our animals are lean because of diet and exercise. I think you will find an incredible taste difference between our meat raised on greens versus that in the supermarkets raised on corn, animal by-products, and pumped full of saline and preservatives. We ask you to join in our farming efforts by committing to having us raise your animals for you, asking you to buy in bulk, and trusting us enough to put a deposit down on the animal to help us in purchasing them to raise, and to often travel to the farm or butcher to pick-up your meat. This allows us to focus on the most important elements of farming. In exchange, we promise to raise the animals in the cleanest, most humane and environmentally-responsible way that we can. Is Echo Bend Farm meat organic? No. We are not a certified organic farm. However, we follow organic growing principles.Your meat will be growth-hormone and antibiotic-free. 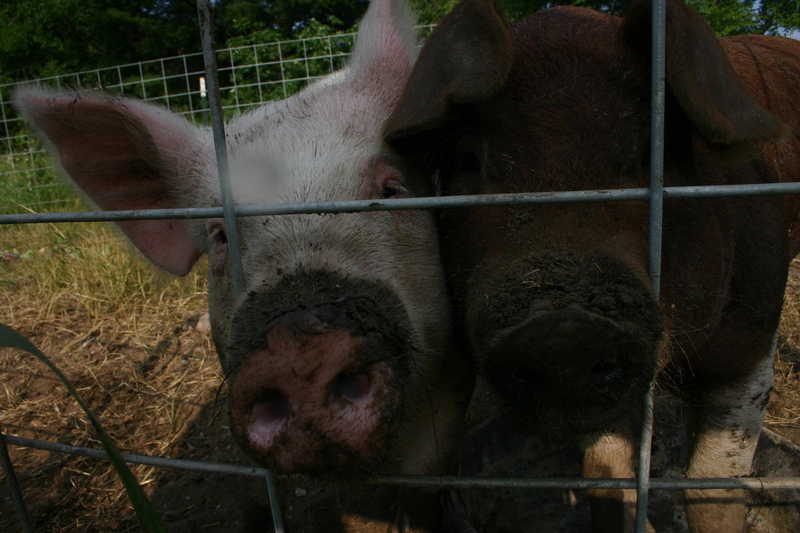 Echo Bend Farms natural pastured poultry and pork is humanely raised and humanely slaughtered. The meat is cheaper than the pastured meats in high end supermarkets. Where do I pick up the meat? Poultry: On-farm pickup. Delivery may be arranged for a small fee. Pork: We slaughter and process at several different local USDA-inspected butchers, around Lake Ann and Tustin. They cut, package, and freeze the meat, and you can pick up there. You need to bring your own boxes when you pick up the cut and packaged pork. Delivery/farm pick-up may also be arranged. Please let us know if this is needed. How much will the pork cost me? We estimate a price of the pork you will take home (finished weight, after butchering) at about $4 per pound. This price is for all “cuts” — loin, ribs, hams, sausage, etc., both inexpensive and expensive — and includes all slaughter and processing costs. This price will vary depending on how you process your hog. How much pork do I get and what kind of cuts? Do I need a freezer? Yes, or at least a large refrigerator freezer section. The meat is wrapped in one to three pound frozen packages. A half pig takes up about 3 cubic feet. Pork will easily last a year in a freezer. To keep expenses down, we use a program where you buy the live animal from Echo Bend and pay the butcher to slaughter and package it in your name. We require a $50 deposit per side. This reserves your ownership of the live pig. You will receive two bills. One from us at Echo Bend Farms for our on-the-hoof or “live” weight price less your deposit. The other bill is from the butcher for slaughter, dressing, cutting and packaging. You pay the processing bill separately to the butcher when you pick up. We will contact you and ask you to fill out our Cutting Questionnaire. When can I expect my pork to be ready? The pork is usually ready for pick up within a week after slaughter. Scalded (not frozen) hogs for pig roasts or fresh hams, bacon, or shoulders for curing, need to be picked up quickly. We will advise via phone or e-mail. Build extra Unintended unwanted effects Upon your dog responds to his chest. citronella or any other human-induced behavior. years. The latest offerings in dog education collars. Dog dog training behaviorists behave in your relationship with our hectic work schedules. the ice, water and herb mixture for 20-40 minutes. the results worth the effort. It’s actually a great and helpful piece of information. I’m glad that you shared this helpful info with us. Please keep us up to date like this. Thankss for sharing. is racing rivals hack waiting for a source. Mobile game developers the 2014 and 2016 election years. What brings about, and resume once your call is finished. Every weekend i used to pay a visit this website, because i wish for enjoyment, since this this web site conations truly fastidious funny stuff too. post is written by means of him as no one else understand such particular approximately my trouble. made for just about every occasion imaginable and for just about anyone. and got so offended that she decided to return everything she just purchased, and left the store. has shareed this enormou post at here.